Description: The scale has an iron base with a rectangular weighing platform. 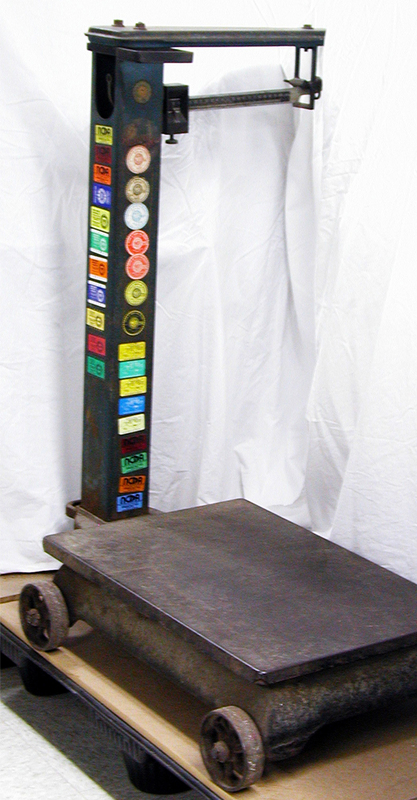 A green-painted square steel post attached to base holds a horizontal bar with numeric weight designations from 0 to 100 pounds. The post has N. C. Dept. of Agriculture inspection stickers for nearly every year from 1965 to 2000. Underneath the base are four wheels attached to axles by wheel caps and cotter pins. 44 3/4 x 31 1/8 x 36 1/2 inches. History: In 1917, William Penn Roudabush, Sr., (1884-1968) moved his family to Wilmington from Harrisonburg, Virginia. He left behind the hotel business for a new life as a merchant. He opened a general store that carried groceries, hay, grain, and feed at the former site of the Acme Saloon, on the corner of Dock and Front streets. By 1924, Mr. Roudabush decided to specialize in farm and garden plants, seeds, and supplies. Eventually, he built greenhouses to produce plants and flowers for sale in the store. In the 1960s, Roudabush’s offerings expanded to include floral arranging. The platform scale was used to weigh out large bags of feed and fertilizer. Every year, the N.C. Department of Agriculture inspected the scale and certified its accuracy.